Animals! I love them. I've grown up around all kinds - you wouldn't believe the variety of wonderful pets I've had, nor just which are the most loving (aside from dogs) - and it's a very common passion. But finding good animal gifts that aren't stuffed toys or t-shirts from The Mountain can be tricky. Indeed, putting this gift guide together I originally had both of those on this list, but I removed them when I remembered why I was making it in the first place. And to be honest, once I started truly looking beyond the obvious, I found some wonderful things! 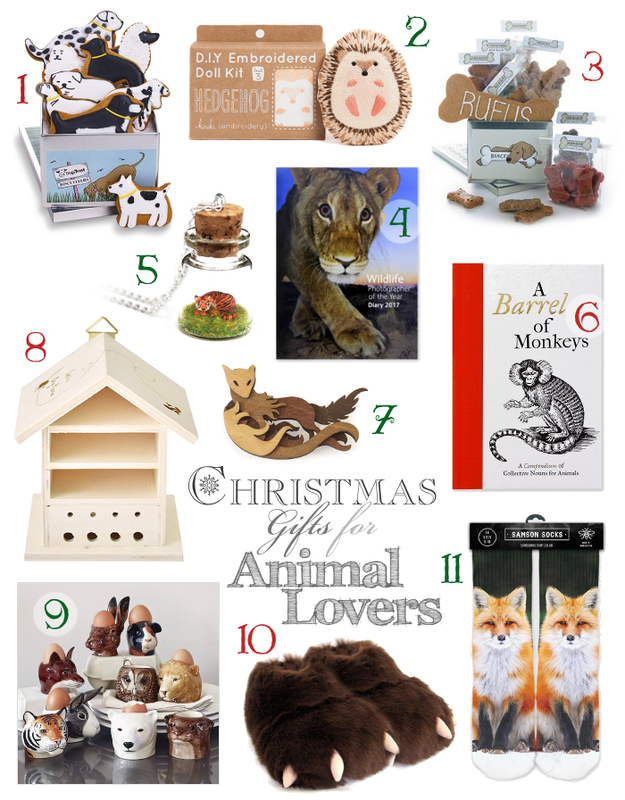 So if you're looking for gifts for animal lovers, look no further! Gift sets of (1) dog-shaped biscuits or (3) biscuits for dogs - every sweet tooth is satisfied and karma is duly delivered, as The Biscuiteers donate a portion of sales from both of their bespoke and handmade biscuity doggy products to The Dogs Trust. And for those with a more savoury tooth than sweet tooth, a wonderful (9) animal head egg cup makes a perfectly whimsical addition to breakfast! For organised animal lovers, the (4) Wildlife Photographer Of The Year desk diary is wonderfully useful and packed with fabulous photos and useful information in a week-by-week plan - I've been buying them for 6 years, myself - and for the bookworm, (6) A Barrel of Monkeys is a great novelty animal book, full of the names of groups of animals. Such as a barrel of monkeys. For the more creative animal lover, how about this wonderful (2) hedgehog embroidery kit? It has everything you need to embroider, stitch and stuff a plush hedgehog! Or for the more practical, a (8) personalised insect house ripe for painting! And for those who simply want to express their love of animals, how about (11) hand printed fox socks? (10) Bear foot slippers? A (7) handmade layered wooden fox brooch? Or, if I may be so cheeky, a (5) handmade animal terrarium necklace in a variety of species? There's something for every personality of animal lover this Christmas! I put this animal lover gift guide together myself. None of the products, brands of websites featured have given me any kind of incentive to include them on this list, they are here purely because I want them to be. Please note, however, that I am not affiliated with any of the brands or websites and neither do I endorse the products. Good luck with your Christmas shopping!